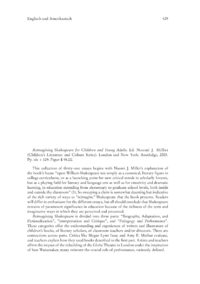 This collection of thirty-one essays begins with Naomi J. Millers explanation of the books focus: upon William Shakespeare not simply as a canonical, literary figure in college curriculums, or as a launching point for new critical trends in scholarly forums, but as a playing field for literacy and language arts as well as for creativity and dramatic learning, in education extending from elementary to graduate school levels, both inside and outside the classroom (3). So sweeping a claim is somewhat daunting but indicative of the rich variety of ways to reimagine Shakespeare that the book presents. Readers will differ in enthusiasm for the different essays, but all should conclude that Shakespeare remains of paramount significance in education because of the richness of the texts and imaginative ways in which they are perceived and presented.